IN THIS ONE... A millionaire puts a huge bounty on the Joker's head; all the bad guys want to collect. CREDITS: Written by Ty Templeton; art by Rick Burchett and Terry Beatty. 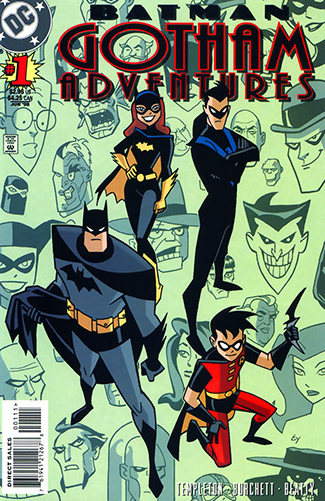 REVIEW: Rick Burchett has always had a nice designy style, but he's outdone himself on Gotham Adventures #1, a double-sized spectacular that has room enough to give each of the four members of the Batman Family something cool to do. Burchett's style is perfect for the more angular designs of the New Batman show, his page layouts following suit with dynamic triangular patterns that complement the figures well. When a 50 million dollar bounty is put on the Joker's head by a distraught but very wealthy father looking to avenge his son, Batman takes the Clown Prince of Crime into custody while the likes of Riddler and Clayface make plays to collect the money. 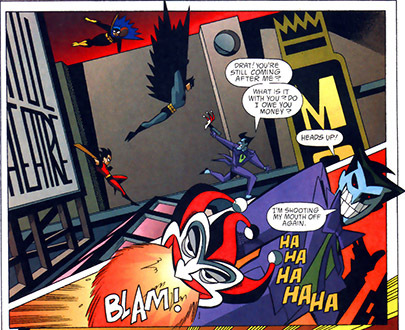 Inadvertently, this makes for one of the better Riddler stories in the expanded DCAU, with some fun riddles to solve. Clayface vs. Nightwing is more action-based, but no less interesting for the time it lasts. And Batman's solution, making the millionaire face the Joker directly and having to choose whether to kill him, is perfect. In the end, he's done more than douse a powder keg, he's made Gotham better, as the 50 million is used for charity. We should however question Batman's decision to keep the Joker in the Bat-cave, so close to all of Bruce Wayne's secrets. Indeed, the Joker is enough of an escape artist that he manages to go up to Wayne Manor, and though it's a nice moment for Alfred, it seems like the villain could one day figure it all out from the clues he's picked up. Damn sloppy of Batman. And yet, it creates enough fun set pieces that I can't quite be against the move. REREADABILITY: High - A fun story filled with action and sleuthing, solved by neither brains nor brawn, but by heart.